Are you looking for the best wifi card for your PC? 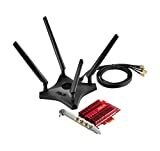 WIFI cards are wireless network adapters that are installed in computers as internet connectors. These WIFI cards are added to computers if there is a slot present in the motherboard. WIFI card provides high speed and uninterrupted internet service. In this guide, I have compiled the list of 10 best Wifi cards for PC 201and will discuss about the specifications of these WIFI cards with their Pros and Cons. The very first Wi-Fi network card adapter that we have is our list is the TP-Link Archer T9E AC1900. I have been using this card since 2015 for my PC. I have never faced any big issues, that’s why I like this too much. The TP-Link Archer T9E AC1900 supports a next generation WIFI standard IEEE 802.11 ac whose transfer rate is faster than regular wireless networks. The TP-Link Archer T9E AC1900 offers dual-band High-speed service for your PC. The 2.4 GHz WI-FI band has 600 Mbps, which is ideal for surfing the web and other daily usages of the internet. The other WI-FI band is of 5 GHz and can provide Wi-Fi speed up to 1300 Mbps, which is ideal for intense online gaming and watching 4K HD videos on the internet without any lag or buffering issue (depending upon your internet speed). The new feature added to this TP-Link Archer T9E AC1900 is the Beamforming technology to receive the directional Wi-Fi signals better and give excellent performance throughout the usage period making it a reliable Wi-Fi card. 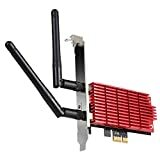 Another feature of this TP-Link Archer T9E AC1900 which makes it stable as well as reliable is the presence of Heat Sink which lowers the adapter temperature making it durable. It also dissipates the heat generated by the adapter. The adapter has 3 external antennas can be easily aligned for better receiving of signal and provides flawless performance. TP-Link Archer T9E AC1900 is very easy to install in the motherboard of your PC if there is a slot provided for PCI adapter, if not then it will be trouble for you. So make sure to check your system for the dedicated slot for Wi-Fi card. The manufacturers provide instruction manual and CD for easy installation. The device works very nicely with Operating Systems like Windows 8 (32/64 bits), Windows 8.1 (32/64 bits), Windows 7 (32/64 bits) and Windows Xp but if you have Windows 10 or Linux you might face a little difficulty in setting up the Wi-Fi card. There is a 2 year limited warranty on the Wi-Fi card and 24×7 technical help is available. Altogether it is a very good Wi-Fi adapter for those who have desktops with Operating System below Windows 10. The next Wi-Fi card is again from Asus. The AC1900 with PCE-AC68 adapter is the predecessor of the previous adapter in our list. The price of this device is $86.81. The AC1900 (PCE-AC68) has a 5th gen 802.11ac chipset that provides 2.4 GHz and 5 GHz dual band speed. The 2.4 GHz band offers a speed of 600 Mbps and the 5 GHz band offers a speed up to 1300 Mbps. A user can easily play online games and stream HD videos without any buffering problems. The device is equipped with 3 x R-SMA antennas which are connected to the chipset making it more flexible for better signal strength throughout the usage. The two way transmission and high gain design boosts the signal receiving strength by 150% than regular adapters removing dead zones. The AC1900 (PCE-AC68) supports operating systems like Windows Xp, Vista, Windows 7/8/8.1. But not Windows 10. The Heat Sink technology provided in the adapter makes the device more stable and durable during elongated use. This device is nice adapter with powerful performance and comes within average pricing making it affordable to most users. If you are looking for the best wireless Card for Gaming, then ASUS AC3100 (PCE-AC88) would be the best for you. It is a high-end gaming wifi card for enjoying the best gaming experience. This card price is a little bit high. But don’t worry, I have low-end gaming wifi card for you as well. This Wi-Fi card is by the best adapter card for PC after Tp-link AC1900. This is an epitome for network adapter cards. The 4×4 AC3100 with PCE-AC88 adapter is for those users who don’t worry about the price and wants the best quality with high-performance products. The AC3100 PCE-AC88 uses the dual-band for high speed. The 2 GHz band provides speed up to 1000 Mbps and the 5 GHz band provides speed up to 2100 Mbps enabling you to enjoy heavy online gaming, internet calls and video streaming up to 4K without any lag or drop. The 4×4 AC3100 with PCIE adapter is 60% faster compared to the 3×3 adapters. The adapter is equipped with latest IEEE 802.11ac chipset, so for best results the desktop must be 802.11ac compatible. There are 4 flexible external antennas are placed on magnetic base for superior signal coverage and are connected by R-SMA antenna connectors for hassle free installation. The 4×4 antennas are 4 transmit and 4 receive design and each antenna is connected to the card with individual cable so that they can be placed over any vertical or horizontal surface. The ASUS Wireless AC3100 PCIe Adapter (PCE-AC88) supports MU-MIMO technology for better usage of 4 Wi-Fi streams concurrently. The customized heat sink technology makes it more stable while working for extended hours thus making it reliable also. The working temperature is 0°C to 40° C.
The ASUS Wireless 4×4 AC3100 PCIe Adapter (PCE-AC88) is supported by every Operating System from Windows 7 to Windows 10 without any issue. The setup is made easy with provided installation CD. The box also contains a warranty card. Altogether this device is set to bring you pleasurable experience with quality performance. The second product in our list is the Archer T6E AC1300 which is also from the house of TP-LINK. This Wi-Fi adapter is almost same to the Archer T9E AC1900 but the speed it provides is lower. The price of TP-Link Archer T6E AC1300 is $44.99. This Wi-Fi adapter is very much popular among the users. The reason is it offers quality performance, stability and reliability to the customers. The TP-Link Archer T6E AC1300 supports a next generation WI-FI standard IEEE 802.11 ac whose transfer rate is 3 times faster than regular wireless networks. Like our first network adapter it also has dual band of speed which can be selected. The 2.4 GHz band provides a Wi-Fi speed of 400 Mbps and the 5 GHz band provides a speed of 867 Mbps. With the speed provided by the TP-LINK Archer T6E AC1300 a user can play online games with ease and stream 4K live videos without any lagging. The Archer T6E AC1300 works with most of the Operating systems Windows 7/8/8.1 and Xp. To make it work on Windows 10 one needs to upgrade the device to 17025 insider preview builds. Sometimes the driver tends to create some problems; you need to reinstall the driver again. But this problem is not common for all Wi-Fi cards. The range of the Wi-Fi card is extended as it is equipped with 2 detachable antennas. But sometimes connection may drop if the router is too far. The heat sink technology reduces the heat produced from inside making it more durable. The Wi-Fi connection is secured from others with WPA and WPA2 encryption. The manufacturers provided 2 years warranty and 24×7 technical help. The installation is made easy with installation CD and user manual. This PCI EXPRESS adapter from the house of Asus has excellent price and performance ratio. The price of the PCE AC56 is $56.65. The network chipset used in the adapter is standard IEEE 802.11 a/b/g/n/ac. 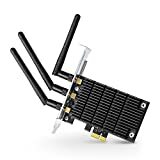 The device provides selectable 2.4 GHz speed up to 400 Mbps and 5 GHz speed up to 867 Mbps for fast web surfing, online gaming and video streaming. The Broadcom TurboQAM technology provides the boosts the performance of the PCE-AC56 by 33%. The heat sink technology brings stability to the device and reduces the problem of overheating. 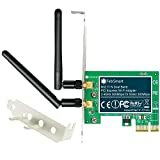 ASUS WI-FI PCI Express Adapter (PCE-AC56) is compatible with Windows Xp, Windows Vista and Windows 7/8/8.1 but doesn’t work with Windows 10 fluently and have problems of signal drop. The design of the adapter boosts the network coverage by 150%. The two antennas are detachable from the chipset. The security of the AC56 is vivid with 64bit WEP, 128bit WEP, WPA-PSK, WPA2-PSK and WPS support. Although the hardware is excellent, the software seems to be not up to the mark of satisfaction. This AC56 is a nice adapter with quality build, nice performance and the trust of ASUS. It is perfect device to satisfy the need of an average user. The next Wi-Fi adapter we have in our list is from the house of Rosewill. The RNX-AC1900PCE is a next gen Wi-Fi chipset that uses latest the IEEE 802.11ac technology. Online gaming, HD video streaming and web surfing is made easy with the high speed connectivity and performance it offers. It also depends on the internet speed of your local area network. The price of this Wi-Fi adapter is $59.99. The RNX-AC1900PCE has dual band that provides 600 Mbps speed with the 2.4 GHz band and 1300 Mbps speed with the 5 GHz band. The 2 GHz band is for light work on the internet like mailing, surfing, etc and the 5GHz band is for heavy online duties like online gaming and enjoying HD videos lag free. RNX-AC1900PCEis equipped with the advanced MIMO technology for reliability and stability while gaming online and video streaming. The device is fully compatible with backward Wi-Fi standards. The RNX-AC1900PCE is best suited with wireless 11AC device but works just fine with every other device. There are 3 detachable antennas provided for wider wireless network coverage and reducing the chance of signal drop. Moreover the antennas are upgradable making the device more impactful for the users. The heat sink technology dissipates the heat away making the device cool and stable for elongated use. The network is secured from the intruders by encryption with 64/128 WEP, WPA/WPA2 and WPA-PSK/WPA2-PSK. With the Beamforming technology the network connections are stronger and reliable. The RNX-AC1900PCE supports all most all versions of Windows like Xp/7/8/8.1 and Windows 10 but not with LINUX. The other drawback of the adapter is that it might not work with Windows update, or the driver update might give trouble to the existing windows. Advanced MIMO tech provides stability and reliability. The TP-Link TL-WN881ND N300 is a basic network adapter that connects your pc to the local network through Wi-Fi. The price of this network adapter is $17.99. From the price it is evident that it is not as fast and reliable as the other adapters mentioned in this list. The TP-Link TL-WN881ND N300 uses standard 2.4 GHz band and provides speed up to 300 Mbps. The Wireless N adapter is compatible with 802.11n/b/g products. The device uses CCA and 2T2R MIMO technology for better performance and stability. Online gaming and video surfing is good but if you want to stream 4K videos then this device is not for you. The adapter has 2 antennas for better range. It works nicely with OS like Windows XP, 7 and Vista but not with higher versions of Windows. Installation is made easy with bundle utility. The system is secured from intruders with wireless encryption 64/128 WEP, WPA/WPA2/WPA-PSK/WPA2-PSK. The Rosewill RNX-AC1300PCE is almost same is the previous wireless network adapter in our list but is somewhat a mini version. It uses the IEEE 802.11AC chipset with dual band for best performance throughout. The difference in this RNX-AC1300PCE is that its 2.4 GHz band provides speed up to 400 Mbps which is enough for surfing the internet and the other 5 GHz band provides speed up to 867 Mbps. The speed provided by the % GHz band is enough for online gaming and watching HD videos. You can’t ask for more from a wireless network card whose price is mere $44.99. The network adapter also has the advanced MIMO technology which provides better stability in performance and reliability. Beamfoming technology is also present in the device. The automatic heat sink distributes the heat away from the core which is a great addition to the tally. RNX-AC1300PCE has two antennas for wider network coverage. The security of the network is done with 64/128 WEP, WPA/WPA2 and WPA-PSK/WPA2-PSK encryption. The device is compatible with all versions of Windows. The drawbacks of this network card are the driver issue with the OS and very bad customer support. 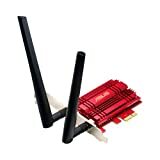 This smart wireless Wi-Fi network card form Feb is designed to serve the purpose of online gaming and video streaming. The price of the network card is just $29.99. You can connect the card to your desktop through the PCI Express slot and connect to the wireless network without Ethernet cable. The adapter is compatible with all 802.11 n/b/g/ac devices. With this network card your PC can connect to the wireless router and enjoy internet with speed up to 300 Mbps through 2.4 GHz band or 5 GHz band. The N600 has built in Qualcom Atheros chipset. The 6dBi external antennas are detachable and are engineered to give good performance and reliability. Your network is ensured with 64/128 WEP, WPA/WPA2 and WPA-PSK/WPA2-PSK (TIKP/AES) protocol so no intruder can seek into your network. And moreover the device is compatible with all the versions of Windows like 7/8/8.1/10, Xp and Windows server (32/64 bits). They are connected to the PCI Express slot X1, X4, X8 and X16 slot. No need of driver installation for WINDOWS 8/8.1/10 but required for Windows 7, Xp and Windows server (32/64 bits).Tech support is available 24×7 at the official website and email address. All over it is nice average Wi-Fi card for average users for gaming and video streaming but with quality performance. The last Wi-Fi network adapter card is Rosewill N300. 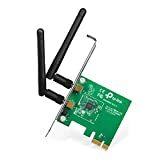 It is a basic card that connects your desktop to the wireless network at your home and enjoy fast internet on your PC without connecting Ethernet cable. The price of the N300 is mere $16.99. It uses the wireless standard IEEE 802.11b/g/n and is compatible with the devices bearing the same standard. The N300 can provide speed up to 300 Mbps using the 2.4GHz band on 11N network. There are 2 5dBi antennas for better coverage of Wi-Fi network and uniform performance but the range still is not as much as claimed. 2T2R MIMO technology provides great output. Network protection is good with WPA and WPA2 encryption preventing the intruder to seek in your network. Operating System supported are Windows 8.1, 8, 7, Vista and Xp. The drawback of this device is that sometimes the provided driver may not work with the OS. As a user you must always remember some important points before buying your Wi-Fi card. You should not just go and buy the best thing available or the cheapest product available. Below are the important points you should consider before buying a Wi-Fi network adapter card. Always remember to check whether the adapter can work with the speed of your internet connection. If your internet speed is very high then you should not buy an adapter whose offered speed is not compatible with your internet speed. Actually it is better to have an adapter that exceeds your internet speed; the reason is with time you can increase your internet speed and if you have an adapter that offers high speed you won’t have to buy a new adapter compatible with your increased speed. Generally routers use two basic type of technology; either the 802.11n or the 802.11ac. Now you must check which type of router you have and select the adapter based on the device you already posses. If the devices use same technology then they will be compatible with each other. Although the 802.11ac is compatible with all but why take a chance. Another thing is the type of band used; single or dual. Dual is the always the best choice as the user can choose between the 5 GHz and 2 GHz band speed. The 5 GHz band offers high speed for online gaming and ultra HD video streaming and the 2 GHz band offers speed lower than the %5GHz. In single band only 2.4 GHz band is used in the single band devices. The router uses only one band you can choose which band to select according to the need. You must check your own computer for which type of slot is provided in your mother board whether it is PCE or PCEI or is there any slot available in your mother board. You don’t want to buy or end up with an adapter that doesn’t fit in the slot provided in your motherboard. Signal strength must be considered before buying because you should buy an adapter that will receive the signal from your router. If your router’s signal is good and covers the area of your desktop easily then any network adapter will serve the purpose. But if signal strength of your router is low then you must opt for the adapter which has wider network coverage with powerful antennas that can easily receive signals from rooms apart and through the walls. The purpose of your network adapter is the most important aspect that is to be considered before buying a network adapter. 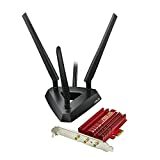 If your purpose is simply to connect your PC to your Wi-Fi router and web surfing, normal works over the internet and video stream then you can choose basic Wi-Fi adapter with your eyes closed. But if the purpose of your network adapter is online gaming and 4K ultra video streaming then you must choose high speed network adapter. After going through all the products specifications and the buyer guide I hope you will find it helpful. .